The choice of reproduction vintage knitwear spans pullovers, cardigans, jumpers and sweaters. Whether a thick sweater is your preference, or a versatile cardigan conducive to layering; there is plenty of vintage style sweaters available now. Knitwear is the perfect solution to keep cozy and warm during the cooler seasons of the year. When favoring a vintage inspired look, sourcing appropriate attire for cold temperatures can pose a challenge. However, this need not be the case. While it may be relatively straightforward to opt for a vintage inspired look during summer months in which a simple dress may suffice, winter also offers many options. Create a vintage inspired look with this cardigan from Top Vintage. Knitwear, sweaters and jumpers started to become popular attire from the late 1800s. During this time, sweaters would be worn for sporting activities due to their ease of movement and breathability. For both genders – women especially, the popularity of sporting activities greatly increased the styles of clothing deemed both appropriate and fashionable. Examples of women’s sweaters from the 1890s include this wool sportswear sweater from the Met Museum and this wool sweater included in the Fashioning the New Woman: 1890-1925 exhibition by the DAR Foundation. Both sweaters reflect the fashionable silhouette of the period – the broad gigot sleeves, high neck and fitted shaped waist. Whilst styles of knitwear may have changed since the late nineteenth century, the function of these garments remains the same. Wool fibers help to retain heat, yet as a natural fiber also enable breathability. Many fibers and materials are used today in vintage reproduction sweaters. For ultimate warmth, a high content of wool is advised. However, man-made fibers can also prove both warm, versatile and more affordable. 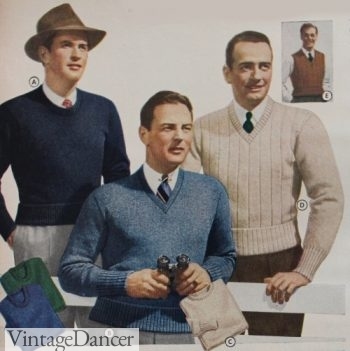 Many of the most popular sweater and jumper styles of the 1930s and 1940s were short sleeved. This allows the wearer to have the option to wear the jumper on its own, or layered either over a long sleeved blouse, or beneath a cardigan. During the 1950s twinsets were especially popular. A twinset consisted of a short sleeved (or sleeveless) sweater, designed to be worn with a matching cardigan, made of the same material and color. There are many vintage style sweaters, cardigans and jumpers available today to choose from. To emulate a 1930s look, try teaming a short sleeved sweater with a calf length skirt. Wear the sweater over the skirt waistband, defining the waist with a belt worn over the two. This delicate sweater from ASOS creates a feminine, vintage inspired style. Cardigans have been a popular item of clothing throughout the twentieth century, due to their versatile nature. As evidenced previously through the sportswear sweaters of the 1890s, cardigans also adhered to the fashionable silhouette of the time in which they were produced. During the 1920s, cardigans were worn long and loose, complementing the low waistlines of the period. The 1930s saw cardigans begin to gain more shaping, and by the end of the decade the hemline had risen to the natural waist. Choose from these vintage style cardigans for a perfect winter style. The 1940s and 1950s were perhaps the most popular decades for cardigans. This was due to the expansion of mass produced knits, and the popularity of home knitting. For classic 1950s style cardigans, opt for a cropped length reaching the natural waist. Look out for patterns and embellishments such as beading and embroidery. For days when the weather is especially cold, a long sleeved sweater is a welcome wardrobe addition. In order to create a vintage inspired look, think about the decade or style you want to emulate. During the 1920s, sweaters were still very much influenced by sports and leisurewear. The neckline may be a deep V, with the hemline reaching below the hips. During the 1930s, clothing reflected the change in the fashionable silhouette. The waist was defined, whilst the hips were narrow. Jumpers and sweaters would be worn over skirt waistbands, with a belt to draw attention to the waist. Keep cozy with this selection of long sleeved vintage inspired sweaters. During the 1940s, shoulder pads were utilized not only in blouses or jackets; but also knitwear. This reflected the strong, almost triangular silhouette popular during the decade. Sweaters would be worn either tucked in or out of waistbands. Sleeve heads may feature gathers. These gathers further enhanced the shoulders, creating a boxy silhouette. Like to knit sweaters? Join these groups to discuss or buy and sell vintage sweater patterns. Add a splash of color with the beautiful embroidered flowers on this cardigan from Top Vintage. From stripes, to Fair Isle, to motifs – the scope for patterns in knitwear is vast. Patterns may be incorporated into knitwear not only through the weave of the knit itself. Surface decoration may also create visual interest and patterns, such as embroidery and embellishments. The beaded cardigan was especially popular in the 1950s. Add a pop of pattern to an outfit with these patterned vintage style sweaters, jumpers and cardigans. For men, there is equally as much choice as there is for women of vintage inspired knitwear. An informal replacement for a waistcoat would be a sleeveless pullover vest. For colder temperatures, a long sleeved chunky wool cardigan would prove sufficient at keeping the cold at bay. Popular patterns include Fair Isle and Argyle – both in part, brought to popularity by the endorsement of the Duke of Windsor. Both patterns originate from Scotland, the Fair Isle design comprised of a small pattern repeat of squares, hexagons and diamonds. The Argyle design is made of overlapping diamond designs, forming a pattern repeat. Shop men’s vintage style sweaters and cardigans. Stay warm in this selection of men’s vintage inspired sweaters and cardigans. Throughout the 1920s up to the 1950s, both Fair Isle and Argyle designs were popular knitwear patterns. Starting in the late 1940s novelty prints such as the reindeer sweater below become trendy. Today, the inclusion of these patterns immediately enables an outfit to emulate a vintage inspired style. Wear them over a button down shirt and tie for a timeless look. Whichever decade you prefer, a vintage inspired style may easily be achieved with the addition of a vintage styled sweater or cardigan. So, ensure you stay warm this winter with this selection of vintage style sweaters, cardigans and jumpers! clothes in this post will turn up in my next book! Thanks Vintage Dancers. I love your blog.